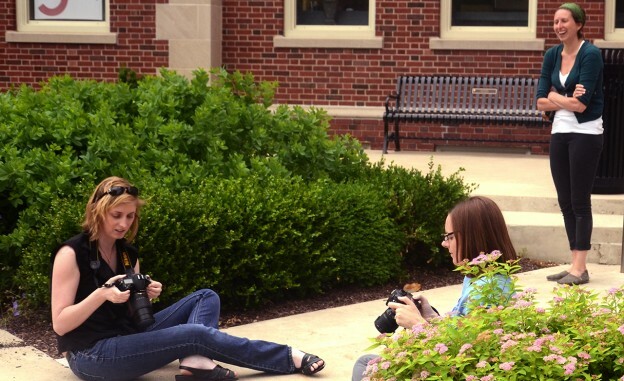 Missouri School of Journalism Ph.D. students Teri Finneman and Joy Jenkins practice making pictures and video with instructor Beatriz Wallace. Photo by Missouri School of Journalism Ph.D. student Marina Hendricks. 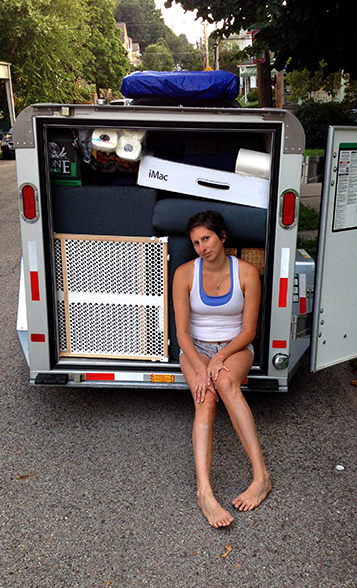 Every time I move, I spend the first day or so sobbing and eating alone at greasy dives in my new town — unpacking, ignoring phone calls and making empty vows to myself. I will never move again. I will never break up again. I will never leave my friends again. I will buy a house and stay in it forever and ever and ever. For one night, I am sure that I can’t do it and that my brain is too old. I put the white flag up and I go to bed. Most recently I experienced this when I moved to North Carolina to start my dream job at the Franklin Humanities Institute at Duke University. It’s been three weeks since my move and I already have amazing new friends. I found a perfect little coffee shop that makes a Moctezuma latte with dulce de leche and cayenne pepper and I swam in a creek. I memorized the food truck schedule outside my favorite micro-brewery, and I joined a drinking running club. When I was a junior at Amherst College I went to a lecture by alumnus and photographer Steve Schapiro who prolifically documented the civil rights movement. Schapiro was 69 years old when he spoke to us. He said that we should practice one thing really well: accepting change. Change. Change. Change. My recent experience leading a group of doctoral students on a blended-learning journey emphasized online tools to get over fear of change. This past summer I taught Ph.D. students at the Missouri School of Journalism. Our class used the Missouri Method to practice, organize and implement skills related to teaching multimedia journalism. We explored a wide range of topics, including video, photography, audio, basic HTML, online publishing, WordPress, post-production and some ethics of new media. The flipped-class approach primarily included outside learning through the MediaStorm Online Training Educational Program videos and the companion training materials. Most of the students had no experience with DSLRs or video production. We made pictures and videos outside that were blurry and underexposed and lacked sophisticated composition. Then we studied and learned and practiced and cared and made beautiful pictures. We watched well-constructed videos and collected technically perfect audio. We found tutorials and made websites. We embedded Twitter feeds and used custom white-balance. We learned Premiere and Photoshop. 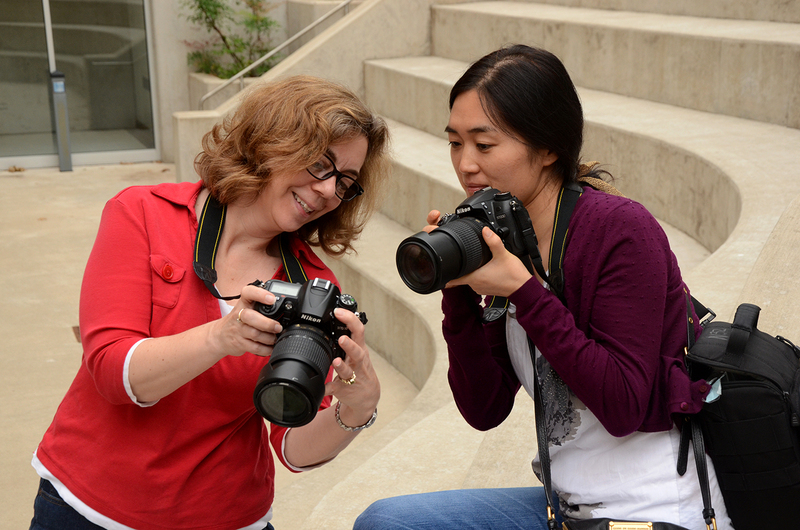 Yvonne Wu and Marina Hendricks practice using DSLR cameras at the University of Missouri – Columbia. We felt perfectly vulnerable and courageous. Our final project was a video that showcased technical skills and documented the process of growth and learning. J7802 from Beatriz Wallace on Vimeo. Our class was an exercise in confidence and effort. Research exists that validates the dangers of telling students that they are gifted or brilliant or naturally genius. Psychologist Carol Dweck and her team at Columbia noted that when children are praised for being “smart” rather than for demonstrated effort, they make choices in the spirit of maintaining mastery, not in learning new skills. Their fear of failure supersedes their curiosity. I am on a crusade to de-stigmatize not knowing by harnessing the power of online learning tools. For MediaStorm’s training videos and the companion classroom materials I created — including rubrics, assignment details and classroom notes — please contact MediaStorm through their Educational Training site. To see the syllabus that we used in the Ph.D. class, visit my website. Beatriz Wallace studied English and photography at Amherst College. She helped implement digital storytelling for children exposed to family violence in rural Missouri, taught multimedia journalism at the University of Missouri in Columbia and worked as a visiting professor at Duquesne University. She is currently a digital humanities assistant and MFA candidate at Duke University and teaches Interactive Journalism at the University of North Carolina. She uses art, data and computer language to analyze, collect and share stories. She has written for Zacuto, MediaStorm and South Writ Large. Find her on www.beatrizwallace.com, Instagram, Facebook and Twitter.